Fitness—that’s what it takes to ride a bike. The apparel company Fitter is committed to promoting an active lifestyle through their brand. Company founder Espen Kateraas is a committed cyclist himself who started the SoCal-based company in 2015 after he became disillusioned with the current cycling shoe market where he felt that too often the scales tipped towards higher prices instead of more value. The company is based on a consumer-direct sales model, which helps keep the prices down. Fitter also offers bundle programs at prices that confused us. Fitter has a bundle of a pair of shoes, matching socks and a $12 gift card for $190. Fitter’s shoes are built around a synthetic mesh outer, a carbon sole and use closure dials made by Freelock. The synthetic mesh is well-ventilated to allow a noticeable amount of airflow to the top, bottom and side vents. Towards the top of the tongue, the synthetic material thins out for a sheer fit. The two strategically placed dials keep the shoes tight in the right places. Once tightened, the dials are positioned towards the center of the shoe, so pressure from tightening is dispersed in a wider area over the middle of the foot. A relatively thin carbon sole keeps the stack height low. The shoes are available with a three-bolt pattern. Fitter also makes sure your feet look good, too, as the shoes are available in five glossy colors. The shoes are built on a narrow last, but there is still a comfortable amount of space in the toe box. Adjusting the Freelock dials wasn’t problem-free. The Freelocks tighten with a clockwise twist and fully release with a click in the opposite direction. When we first wore the shoes we accidentally over tightened them, and while pedaling on the road we tried to loosen them but waited till we were stopped at a light to finish the extra step of re-tightening them. Once properly adjusted, the dials provided a precise fit, pulling the outer mesh tight and molding the shoes securely around our feet. After extended use the outer material stretched around our feet, and we noticed the dials required extra tightening. 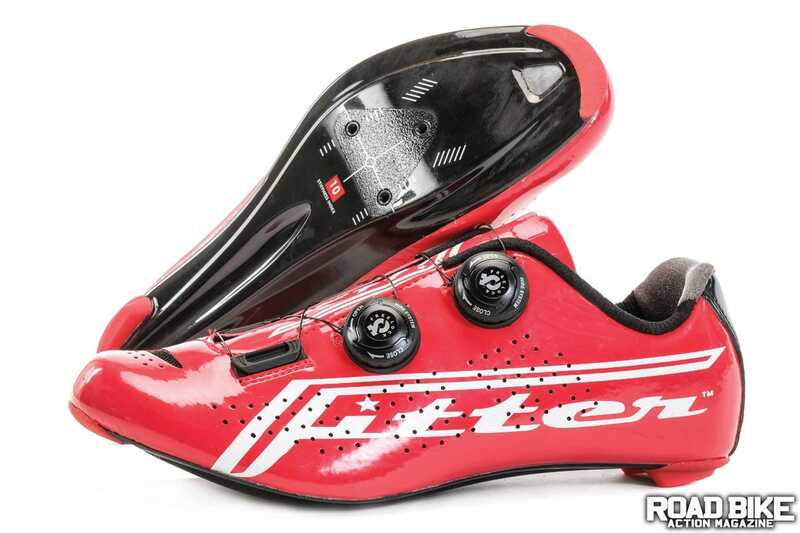 There is a minimal amount of flex in the sole, which added an efficient, comfortable feel during most rides. However, on longer rides hot spots tend to develop over time. Without a doubt, Fitter’s high-performance road shoe delivers a whole lot of bang for your buck—carbon soles, two dial-retention systems, lightweight and well-ventilated upper mesh for under $200. Nice. Nicer still was how well our Gloss Red shoes stood out in a ho-hum pack of black and white kicks. Fitter’s grass-roots approach to the cycling apparel market is a fresh reminder that while the cost of good equipment continues to climb, there are still less expensive and reliable solutions to be found.